Founded in 2003, Bluebells has always enjoyed a reputation for quality education combined with safe and child friendly environment to young students. Abraham Lincoln said “You can be anything you want to be in life”, it is a quote that we at Bluebells believe in. Education holds the key to this. The curriculum is designed for all round development of each child. What a child learns in school prepares him/her for a career, however the skills that he/she learns in a more informal environment through constant interaction and hands on experience are skills that play a vital role in his /her overall development. At Bluebells, very often we take stock of what we have done so far and plan ahead to what the future should hold. It is this desire to make a meaningful difference in the field of nursery education that makes us different. 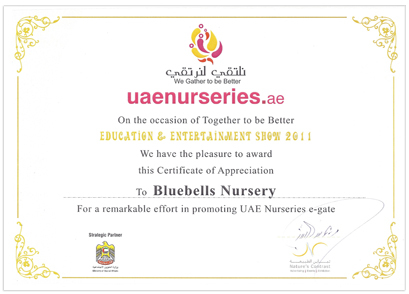 We are the proud recipients of the EXCELLENCE AWARD from the Ministry of Social Affairs and Nurseries Department in 2011. Bluebells British Nursery is backed by a strong management with thirty years of experience in Education and Child Health in the UAE. We are backed by a highly qualified administrative team with a strong experience in pre-primary education. Our ancillary staff is highly trained in child care. We support our parents with effective guidance in school placements. 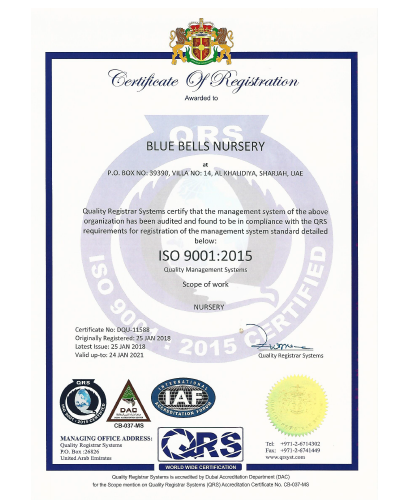 We are happy to announce that we have been ISO 9001:2015 certified by Quality Registrar Systems. We owe this recognition to our efficient team and their cumulative efforts which helped us in achieving the same. Expanding a child's understanding and skills. all-inclusive atmosphere for learning that will provide our students with the opportunities to develop self esteem and skills necessary to continue individual growth and become contributing members of the society.